Avengers: Age of Ultron doesn't hit theaters until next May and already we're obsessing about the film (or films) that will follow it. Rumors are circulating that Avengers 3 will actually consist of two movies--which makes absolutely no sense. Wouldn't another film automatically become Avengers 4? I was pretty good at math in school. Guardians of the Galaxy continuing to climb up the box office charts is hardly news anymore, but darned if it's not still doing it. 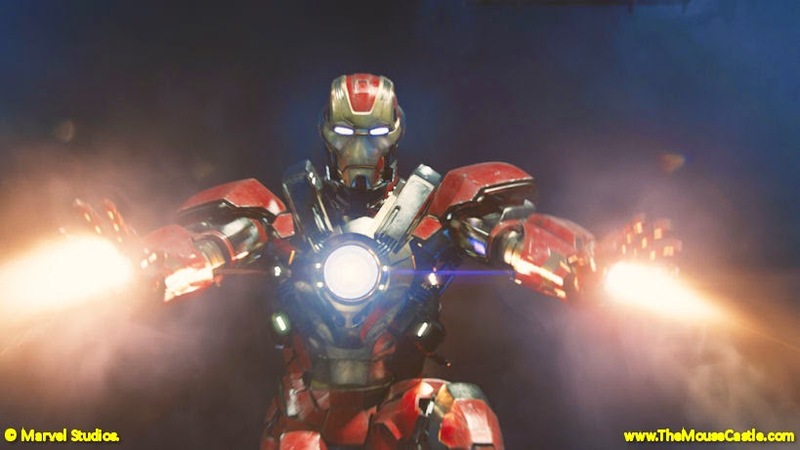 It's now the third biggest Marvel movie ever in the U.S., taking in $319.2 million domestically since its August release and trailing only Iron Man 3 and The Avengers. In legal wrangling dating back to 2009, Marvel has finally reached an agreement with the estate of the late writer/artist Jack Kirby. Kirby was the co-creator of classic superheroes including Captain America, Thor, Hulk, Iron Man and the X-Men. He is considered one of the all-time greats in his field and worked alongside fellow comic book legends Stan Lee and Joe Simon, among many others. Kirby's family had filed suit against Marvel and other media companies including Disney in an attempt to acquire copyrights and back profits for characters and stories created by Kirby. A brief statement released by Marvel and Kirby's estate on Friday said, "Marvel and the family of Jack Kirby have amicably resolved their legal disputes, and are looking forward to advancing their shared goal of honoring Mr. Kirby's significant role in Marvel's history." On the Star Wars front, actor Oscar Isaac (Inside Llewyn Davis), who will be in Episode VII, laments like so many of us the changes George Lucas made to the original trilogy. Meanwhile, director David Fincher (Gone Girl), once considered to direct Episode VII, reveals his take on the trilogy. Alexander Cooper (Ed Oxenbould) is 11 years old and having, well, a horrible, no good, very bad day that begins with gum stuck in his hair and goes downhill from there. And just when he thinks no one in his practically perfect family can relate to his suffering, everyone of them starts having a horrible, no good, very bad day of their own. How they cope and pull together as a family is the premise of Disney's new comedy Alexander and the Terrrible, Horrible, No Good, Very Bad Day. The film also stars Steve Carell, Jennifer Garner, Dylan Minnette and Kerris Dorsey as Alexander's family. It's directed by Miguel Arteta and is based on the award-winning children's book by Judith Viorst. In the clips below, we get the perspective of Alexander's brother Anthony (Minnette), who starts his day out #blessed before his life suddenly goes south. Alexander and the Terrrible, Horrible, No Good, Very Bad Day opens in U.S. theaters on October 10. 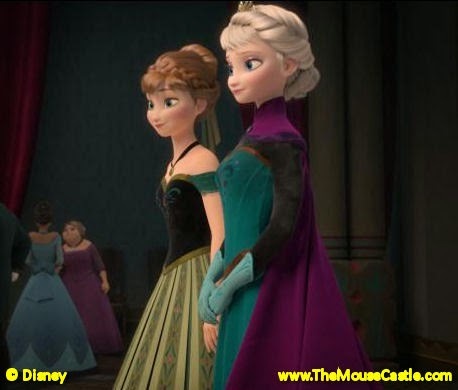 Click here for more Disney movie trailers and clips from The Mouse Castle. Do you want to file a lawsuit? Anthony and I approached the latest episode of Inside The Mouse Castle with a single objective: how to get $250 million from Disney by filing a frivolous lawsuit. You know, just like author Isabella Tanikumi appears to have done. 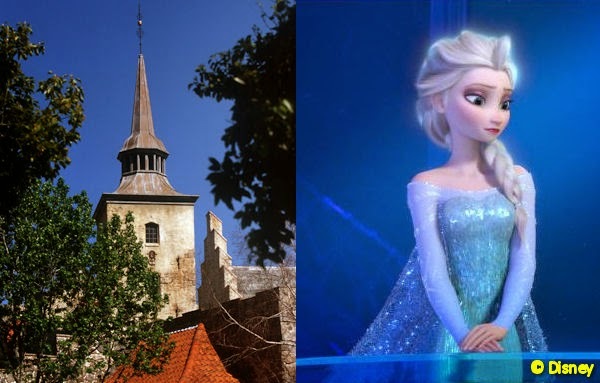 According to her, Disney stole story elements from her autobiography Yearnings of the Heart to make Frozen. Apparently Hans Christian Andersen had nothing to do with it. The latest Big Hero 6 trailer is cute and cuddly, emphasizing warm hugs over comic book action adventure. We still like it. 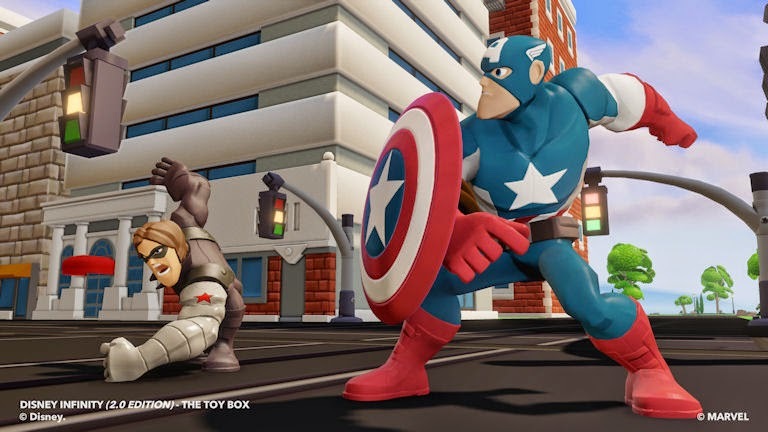 I review Disney Infinity 2.0. 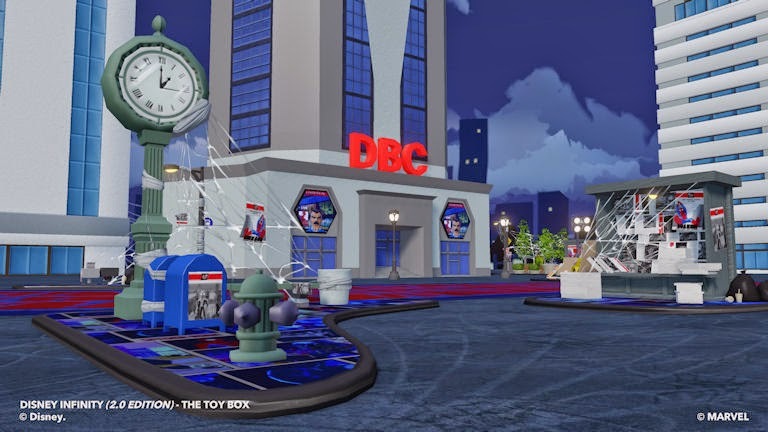 The Toy Box mode has definitely improved, making it easier to build you're own worlds, but the adventure game play in the playsets is repetitive and less imaginative than the original. It will not disappoint fans of the game, but it won't blow them away either. 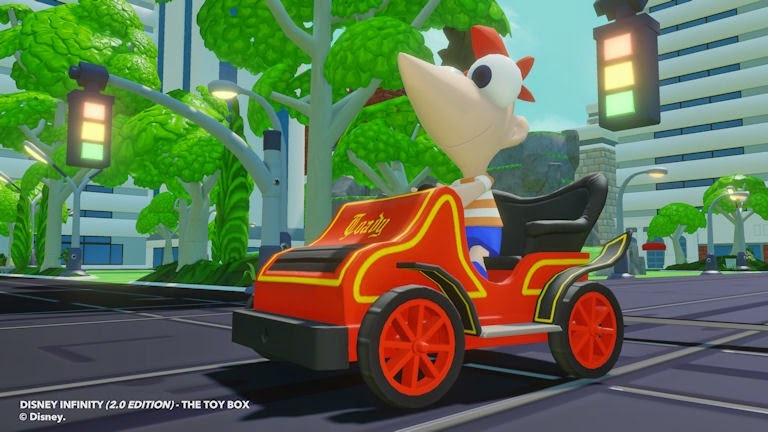 Call this game Disney Infinity 1.5. 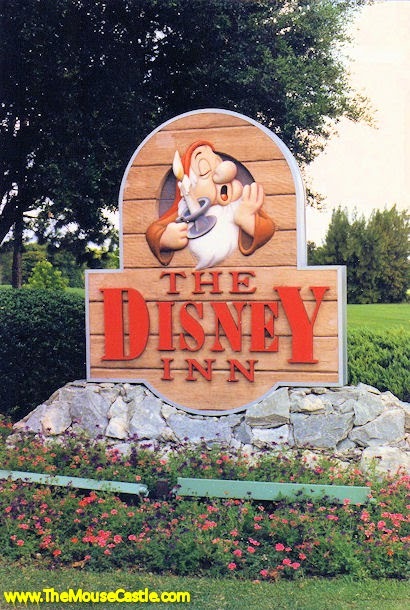 In the summer of 1987, I stayed at The Disney Inn at Walt Disney World. The hotel was originally named the Golf Resort when in opened in 1973. It changed names in 1986. The Disney Inn had over 500 rooms and was located adjacent to the Palm, Magnolia and Oak Trail golf courses. Hiro and Baymax in Big Hero 6. Walt Disney Animation Studios has released a new trailer for Big Hero 6, revealing yet another Disney hero with a tragic back story (no dad, older brother presumed dead). In the East/West mashup city of San Fransokyo, teen robotics whiz Hiro, with the help of his friends and his cuddly robot Baymax, take on a crazed super villain who wears a kabuki mask. Big Hero 6 is based on the Marvel comic book series of the same name, but Disney appears to be going out of its way to identify the film as strictly a Disney Animation product. There'll be no confusing this flick with any entry in the Marvel Cinematic Universe. That said, it looks like a lot of fun. 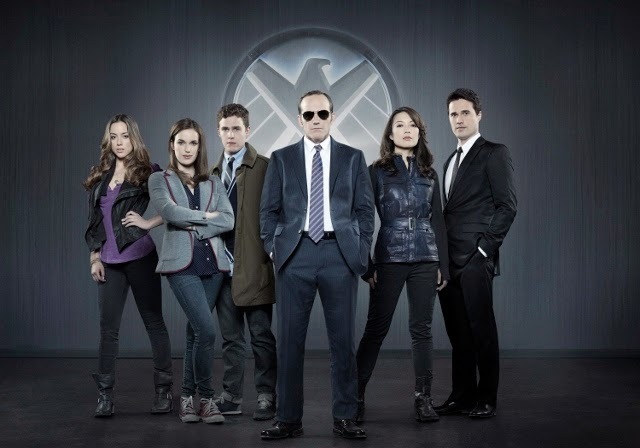 It's a glorious day to be a nerd with the premiere of season two of Agents of S.H.I.E.L.D. and the launch of version two of Disney Infinity. Anthony and I riff on binge watching season one of AoS and where we think season two is headed, and then I gush over how gaming with Marvel super heroes is the BEST THING EVER! Guardians of the Galaxy has finally lost steam at the box office, but it still keeps rolling along in the Marvel Cinematic Universe, becoming the fourth highest-grossing Marvel film ever. Walt Disney Studios' holiday release Into the Woods caused a stir when it (supposedly) started giving the characters from the Broadway musical Disney names like Prince Charming, Flynn Ryder and Lady Tremaine. And then suddenly the names changed back again. Was it a mistake or just a trial balloon gone bad? On Saturday, the Backlot Tour at Disney's Hollywood Studios will close forever. That same day, the Finding Nemo Subs will return to Disneyland, but for how long? Anthony and I speculate on the future of both these areas. 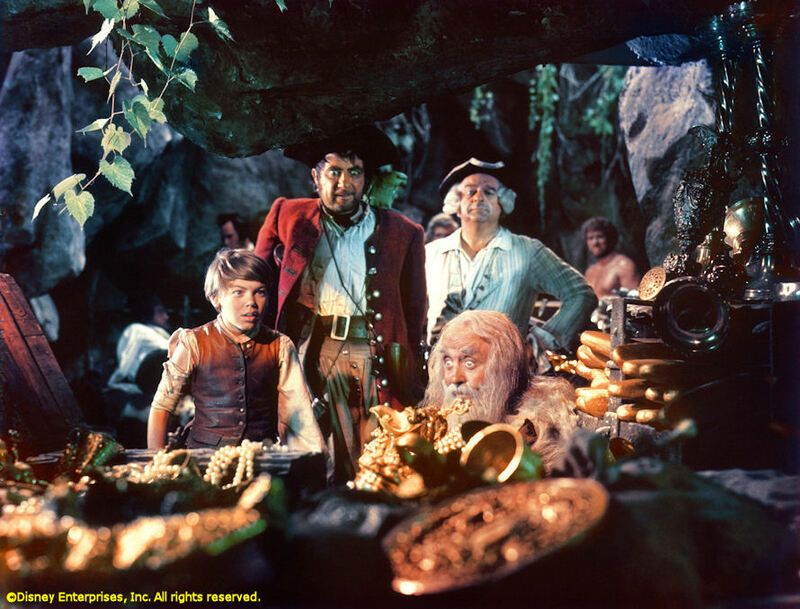 Disney's original pirate film, Treasure Island. Hoist the sails and shiver me timbers! Anthony and I mark International Talk Like a Pirate Day (September 19) by, well, talking like pirates and celebrating the great buccaneers of Disney films from Long John Silver (Robert Newton) to Captain Jack Sparrow (Johnny Depp). We also look back at the origins of this offbeat piratical observation, tracing it to two guys playing raquetball and humorist Dave Barry. No, really. We also honor iPhone 6 day (well, I do--Anthony's loyal to Android) and reveal where to find cool Disney covers for you new Apple device online and in the parks. The Epcot International Food & Wine Festival is going on right now and we cover some of the tasty treats you need to be trying. We also have our suggestions of what wine goes best with Inside The Mouse Castle (hint: it's not wine). 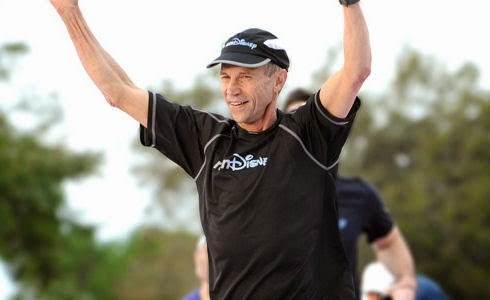 The Walt Disney World Marathon Weekend is January 7-11, 2015 and runDisney is offering a "Goofy Giveback" to allow more runners the opportunity to participate in the marathon and half marathon. Is it a clever promotion or is Disney covering for an event that may not be selling as well as they hoped? On the Marvel front, Dr. Strange will go into film production next spring and may or may not have Joaquin Phoenix playing the title role. Also, TNT has secured the broadcast rights to at least five future Marvel films. And, even though it's Marvel, but has nothing to do with Disney, we're excited about 20th Century Fox's long-awaited Deadpool which may finally become a reality starring (we hope and pray) Ryan Reynolds in 2016. Will Frozen ever run out of steam? From speculation on who will say (or sing) what when Anna and Elsa join Once Upon a Time to a contest where you can sing "Let it Go" to your heart's content, the animation blockbuster still refuses to slow down. Are you a Disneyland APer who wouldn't mind taking part in a more laid back sing-along? You can do just that at special screenings of The Jungle Book and The Lion King at Disney California Adventure. Visit https://event-registration.disneyparks.disney.go.com/disneyland for details. Safety regulations are requiring Disneyland to make some repairs and enhancements to the Sleeping Beauty Castle drawbridge that could prevent it from ever raising and lowering again. Is this really a big deal or is Cal/OSHA out to destroy Disney aesthetics? We can't wait to get our hands on the new book Marc Davis: Walt Disney's Renaissance Man. It won't be available to the general public until October 7, 2014, but poke around the parks now and you might be able to find an early copy available for purchase. If it's always been your ambition to belt out "Let it Go" while appearing in a Kohl's commercial, well now's your chance. Disney Interactive and Kohl's are inviting Frozen fans to sing the Oscar-winning tune, shoot a video of it and submit it for a chance to appear in a Kohl's holiday commercial airing on ABC during the 2014 Amercian Music Awards on November 23. First prize includes air travel and hotel accommodations for five days and four nights in Los Angeles. Music and lyrics (and contest rules) are online at www.disney.com/frozenfriday. You can also enter by downloading the free Disney Applause app for iOS and Android. All entries must be received no later than September 29th, 2014. 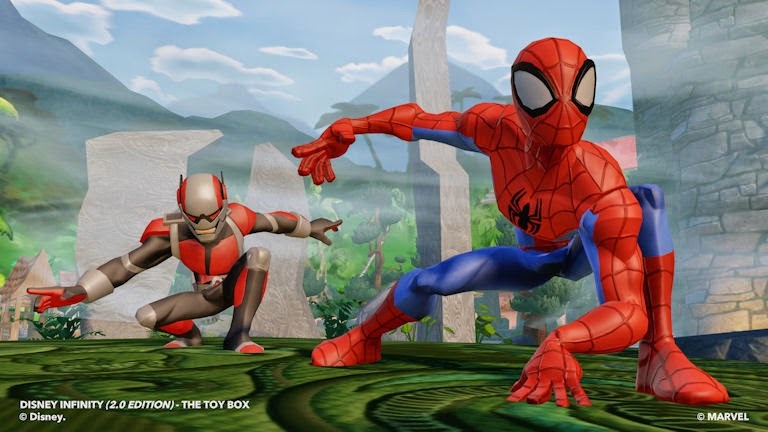 We're just days away (September 23) from the official launch of Disney Infinity 2.0, the next wave of characters and worlds for Disney Interactive's popular video game universe. 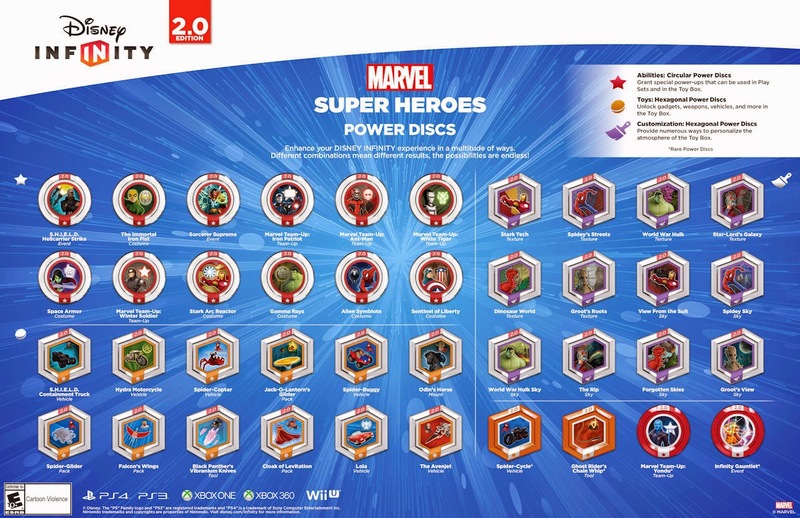 And while the new Marvel Super Heroes and Disney Originals playsets are looking pretty cool, I think I'm most impressed with the multitude of Power Discs that will be rolled out with 2.0. These circular and hexagonal discs add various props, tools, powers and environments to your Disney Infinity experience. All told, there will be 82 (!) new discs to experiment with. Of course, just like with 1.0 you'll have to buy the discs in blind 2-packs, so you won't know exactly what you're getting until you plunk down your five bucks (unless you wait for the discs to show up on the secondary market with their inevitable markup). World War Hulk Sky - Turn your blue skies green with this Hulk themed Power Disc. World War Hulk - Customize your landscape to make it look as if Hulk went on a smashing rampage. View from the Suit - Ever wonder what it's like to see the world from inside Iron Man's helmet? Check out the Hologram Readout Tech upgrade and unlock Stark Industries “View from the Suit”. Stark Tech - Deck out your Toy Box compliments of Tony Stark. Unlock the Stark Industries Tech theme with upgraded Hologram Readout Tech ability. The Rip - Turn Toy Box skies into the skies of Knowhere with this Power Disc and transport yourself to the outer edge of all space and time. 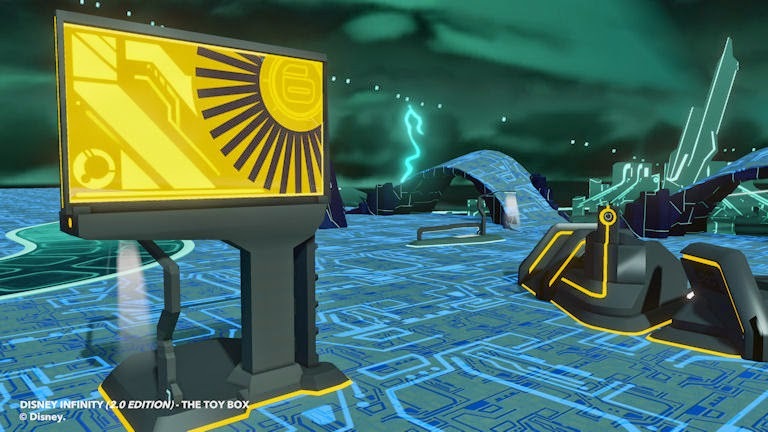 Star-Lord’s Galaxy - Turn your Toy Box into Knowhere - Star-Lord’s home base in the Galaxy. Spider-Sky - The forecast will be sunny with a 100% chance of spider webs with this power disc. 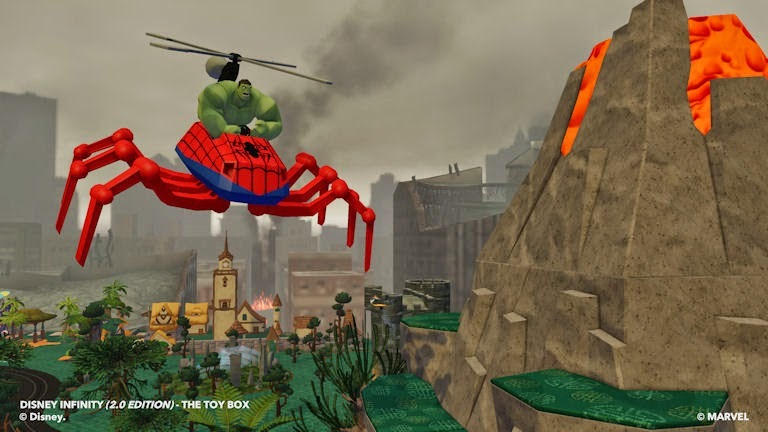 Spider-Streets - Customize your Toy Box with Spider-Man themed streets and buildings. 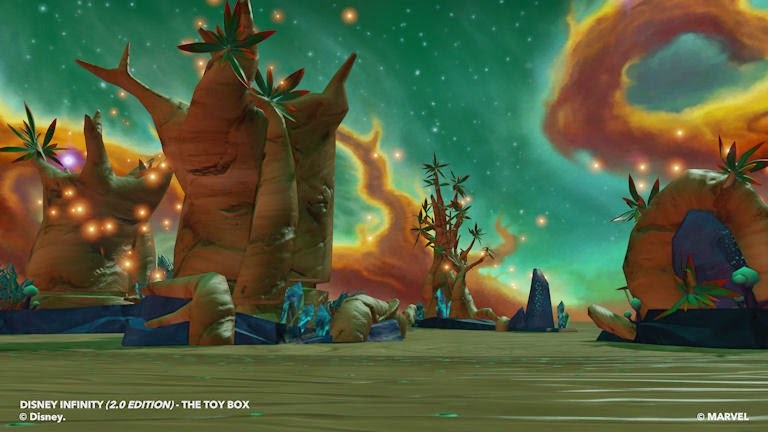 Groot's View - Embrace your inner green thumb and theme Toy Box skies out Groot-style. Groot’s Roots - Theme out your Toy Box world with Groot’s Roots. It’s sure to grow on you! 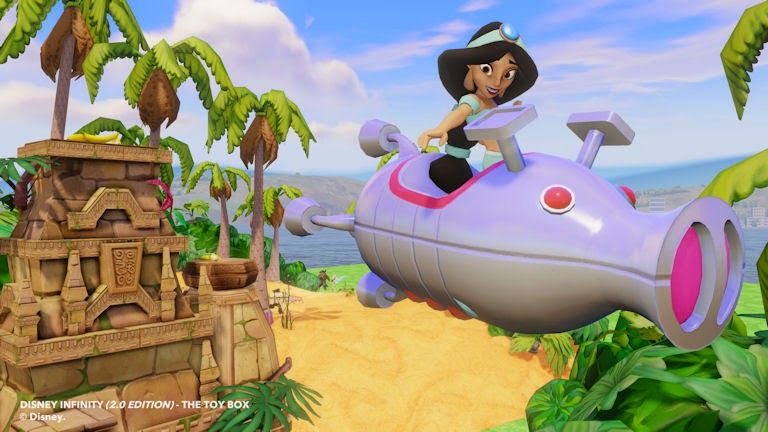 Forgotten Skies - Unlock Forgotten Skies for Toy Box. It’s a Dinosaur World lover’s dream come true. Dinosaur World - Deck your Toy Box out with Dinosaur World terrain, textures and landscapes. Things are about to get pre-historic! S.H.I.E.L.D. Containment Truck - Contain enemies and protect civilians with this S.H.I.E.L.D. truck. Hydra Motorcycle - Take Hydra's Motorcycle for a spin. Sidecar included. Lola - Need a ride? Unlock this Agents of S.H.I.E.L.D. hover car. 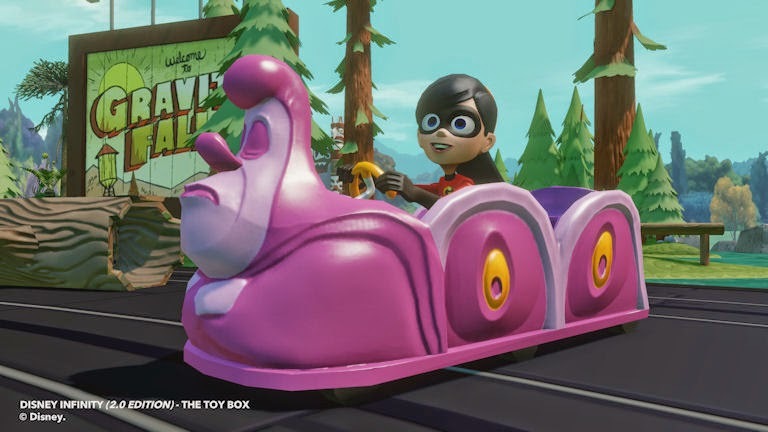 The Avenjet - Hop on board the Avenjet for a speed boost in your Toy Box. Odin’s Horse - Hop on Odin's 8 legged steed, for super speed! Spider-Buggy - Take a ride in the Spider-Buggy. Equipped with web bolts to entangle enemies. Spider-Copter - Shoot web bolts from above in Spidey’s Spider-Copter. Spider-Cycle - Care to go for a spin on the Spider-Cycle? Web bolts included! Black Panther's Vibranium Knives - You’ll be slashing like a fierce cat when you borrow Black Panther’s Vibranium daggers. Ghost Rider’s Chain Whip - Unleash Ghost Rider’s Mystical Chain with this rare and powerful disc. Falcon’s Wings - You'll be soaring when you put on Falcon's Wings. Jack-O-Lantern’s Glider - Glide into action with Jack-O-Lantern’s Glider. Spider Glider - Lucky you! 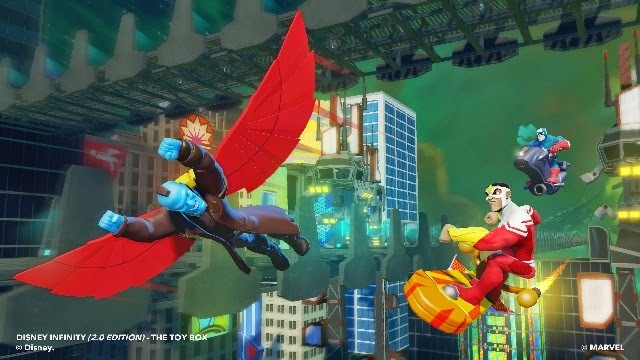 Spider-Man is letting you take his jet glider out for a ride. Cloak of Levitation - Try on Dr. Strange's Cloak of Levitation and glide into action! Sorcerer Supreme - Use Sorcerer Supreme's Bolts of Balthakk to strike down your enemies. S.H.I.E.L.D. Helicarrier Strike - Send down a missile strike from above. Your enemies will need to take cover. Infinity Gauntlet - Summon a force field of cosmic explosions to devastate your enemies. This is a rare and powerful disc! Marvel Team-Up: Iron Patriot - Hit them hard, hit them fast, hit them everywhere! Iron Patriot reporting for duty. Marvel Team Up: Winter Solder - Team up with the Winter Soldier and catch your enemies in the crossfire. Marvel Team-Up: White Tiger - Fight alongside White Tiger who conquers her enemies with feline power and grace. Marvel Team-Up: Ant Man - Team up with Hank Pym (aka, "Ant-Man”) - he’s small, but packs a big punch! Marvel Team-Up: Yondu - Fight alongside this powerful, arrow shooting ally and send enemies running for their lives. Gamma Rays - Time to get old school and unlock the Original Grey Hulk costume with added smash! Alien Symbiote - Slip into this infamous Spider-Man costume and boost your range for pick-ups. The Immortal Iron Fist - Become the Immortal Iron Fist for chi-powered healing and the dreaded Iron Fist attack! 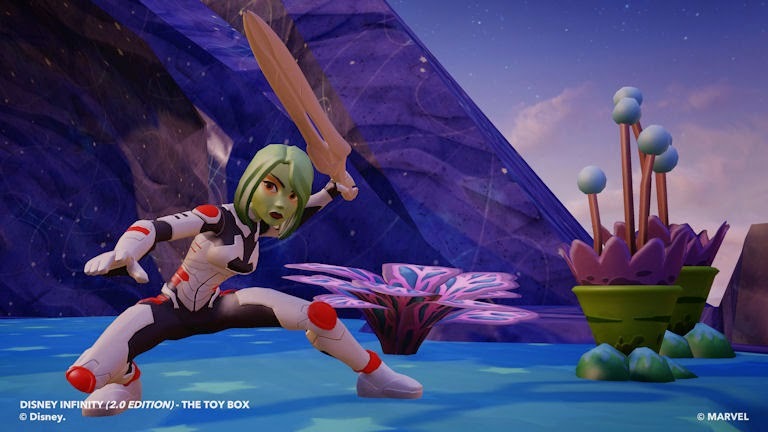 Space Armor - Unlock Gamora's out of this world Space Armor costume for added protection against enemies. Who says fashion can't be functional too? Skies of the World - Enjoy colorful skies inspired by the classic Disney theme park ride, “It’s a Small World”! 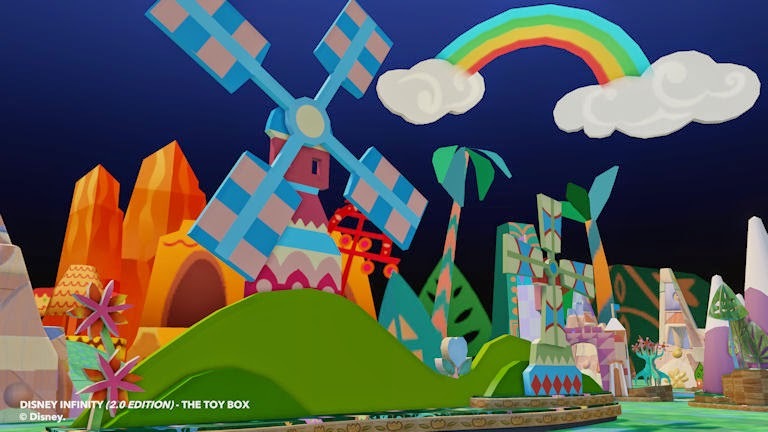 A Small World - It’s a Small World inside of an infinite Toy Box! 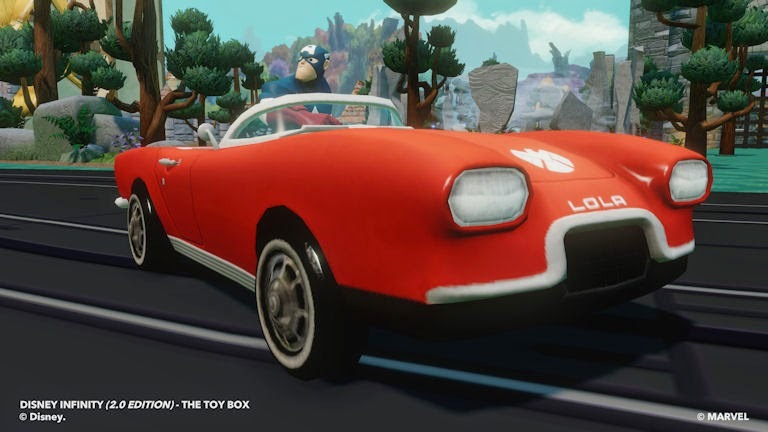 Enjoy terrain and textures inspired by this classic ride from the Disney theme parks! The Middle Kingdom - Decorate the skies of your Toy Box with softly painted mountains and Asian stylized artwork. Inspired by the movie Mulan. Mulan's Countryside - Activate this Power Disc to give your Toy Box terrain the look of Chinese silk. Inspired by the movie Mulan. Cy-Bug Swarm - Cy-Bugs dance above the Hero’s Duty world from the movie Wreck-It-Ralph. All your Toy Box is missing is Sergeant Calhoun! Calhoun’s Command - Deck your Toy Box out like a scene from Hero’s Duty from the movie Wreck-It-Ralph. Sergeant Calhoun approved! Gravity Falls Forest - Wake up and smell the pine trees! Change your terrain into the forest from Disney XD's series, Gravity Falls and enjoy streams, trees, rocks and more! Gravity Falls Sky - Unlock a pine forest, water falls and beautiful blue skies with this Power Disc. You'll feel like you've stepped into a scene from Disney XD's series, Gravity Falls! Neverland - Use this Power Disc to transform your Toy Box into the world of Peter Pan! Second Star to the Right - Fly through the night skies of London, just like Peter Pan! Simba’s Pridelands - Your Toy Box will look just like Simba’s homeland with these Savannah textures! 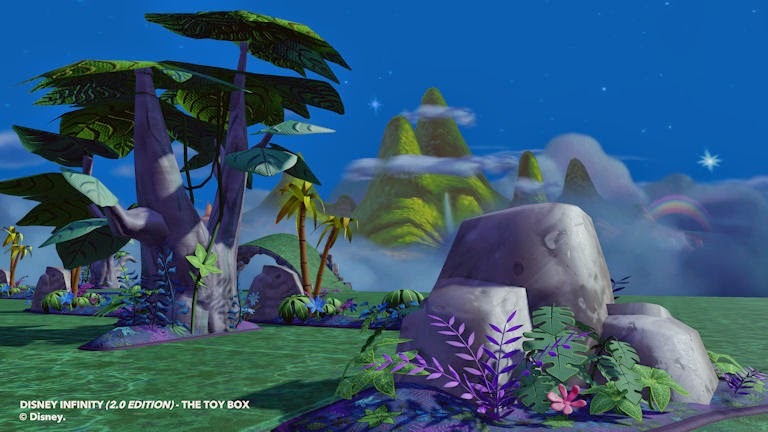 The King’s Domain - Your Toy Box skies will look like the skies of the savannah from the movie The Lion King with this Power Disc! Jasmine's Palace View* - Transform the skyline of your Toy Box with this Power Disc and you will feel as if you're in the land of Agrabah! The Sands of Agrabah* - Transform your Toy Box terrain into the dunes and desert of Agrabah! Jack Skellington’s Reindeer - Ride Jack Skelington’s trusty skeleton reindeer! We promise it’s more comfortable than it looks. Medusa’s Swamp Mobile - Hop on Medusa’s motorcycle with super boost ability from the movie The Rescuers! Alice in Wonderland’s Caterpillar - Take a seat on Alice’s Caterpillar from the ride at the Disney theme parks. One added bonus; smoke bombs! Mr. Toad’s Motorcar - Hop into Mr. Toad’s Motorcar, equipped with an ejector seat. You’re in for a wild ride! 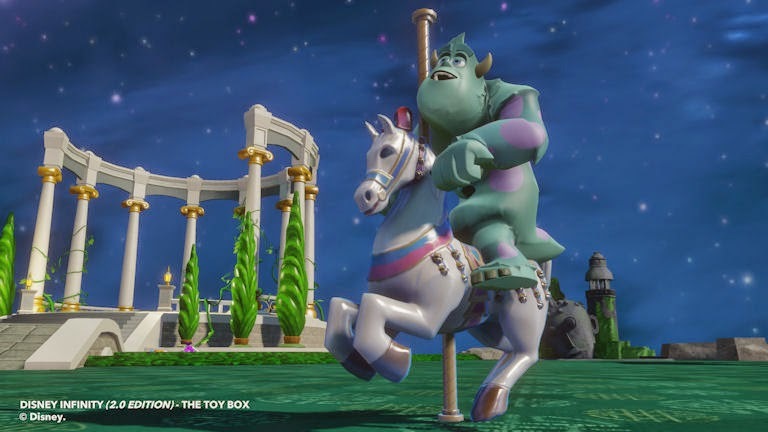 Fantasyland Carousel Horse - Ride the Fantasyland Carousel Horse around your Toy Box! Darkwing Duck’s Ratcatcher - Take this motorcycle for a spin and smoke bomb your enemies! Aerial Area Rug - Take a ride on this Phineas and Ferb creation - A flying area rug with an ejector seat! Main Street Electrical Parade Float - Toss bombs of confetti at your enemies from this beautiful parade float! Le Maximum - Take a ride and honk your horn in this Interpol car from the movie, Muppets Most Wanted! USS Swinetrek - Blast off in the USS Swinetrek! Equipped with squealing missiles! Gus the Mule - Ride this football-playing Mule, Gus, from the classic Disney movie! Eglantine’s Motorcycle - Check out this classic motorcycle from Bedknobs and Broomsticks! It has a side car and ejector feature for ultimate fun! Lew Zealand's Bomerang Fish: Target your enemies with the Boomerang Fish - throw it away, and it will come back to you! Tartar sauce not included. Sergeant Calhoun's Blaster - Take out your enemies with Sergeant Calhoun’s Blaster, from the movie Wreck it Ralph. Darkwing Duck’s Grappling Gun - Use Darkwing Duck’s Grappling Gun to hook your enemies and help you climb to new heights! Mabel's Kittens for Fists - Devastate your enemies with the most adorable, cuddly weapon you'll ever get your fists on! Designed by the one and only Mabel Pine from Disney XD's series, Gravity Falls. Chem Capsules - Toss your Chem Capsules at your enemies and create a cloud of frost that freezes them right in their tracks! From the movie Big Hero 6. Aladdin’s Magic Carpet - Your wish for flight has been granted. Soar above your Toy Box on Aladdin's Magic Carpet with this rare Power Disc! Jim Hawkin’s Solar Board - Hover above your Toy Box creations on Jim Hawkin’s Solar Board! Chernabog’s Spirit Cyclone - Summon a whirling spirit from the Disney classic, Fantasia, and scare your enemies with eerie sounds! Maleficent Spellcast - This disc of power will serve you well. Defeat your enemies with Maleficent’s Green Flame spell! King Louie's Monkeys - Bombard your foes with coconuts and bananas as a band of screaming monkeys cheer you on! Zeus’ Thunderbolts - With this Power Disc, you control the skies like a god of Olympus! Make bolts of lightning arc down from above, damaging your enemies. The power of Zeus is with you. Rags to Riches - Slip on this Prince Ali costume for added style and increased riches!! All for One! - Don't get your feathers in a ruffle quite yet!! Put this 3 Musketeers costume on and enjoy a generous experience increase! Cursed Pirate Gold - With Jack Sparrow’s Cursed Pirate Gold costume, you gain a new damage shield! Who says curses are always bad? Sandy Claws Surprise - Slip on Jack Skellington’s Sandy Claws costume, with a chance to scare with each hit! The Glory Days - Try on Mr. Incredible’s Glory Days costume, and you’ll get added currency from each enemy you defeat! *The Sands of Agrabah and Jasmine’s View Power Discs will be available in 2015. 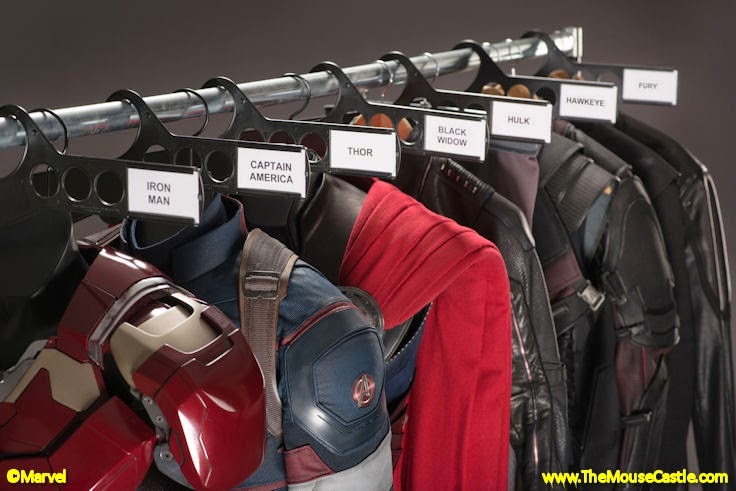 Avengers good. Ultron bad. Got it. 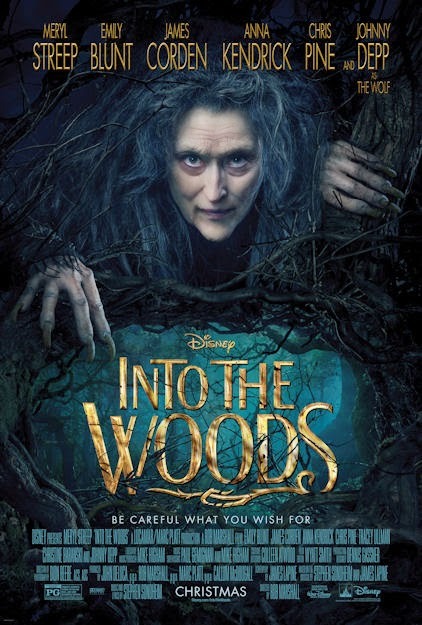 And here's a first look at the movie poster for Rob Marshall's adaptation of the Stephen Sondheim/James Lapine Broadway musical Into the Woods. It opens on Christmas Day. Anthony and I take on these pressing issues and a multitude of others in the latest edition of Inside The Mouse Castle. James Bond in Star Wars: Episode VII? It could happen as Daniel Craig and a bevy of other Hollywood stars clamor for cameo roles in a galaxy far, far away. The movie rumor mill says Obi-Wan Kenobi is getting his own movie, and Marvel antihero the Punisher may have already appeared in Captain America: The Winter Soldier without us even knowing it. Director David Fincher (The Social Network) was once attached to a remake of Disney's 20,000 Leagues Under the Sea. He has some interesting things to say about why that didn't happen. A fire at Walt Disney World's Animal Kingdom Lodge led to guests being evacuated from the resort for two hours. No injuries were reported in the small blaze that started in a storage room. Is Disney getting carried away with park events that come with an added price tag? The scaling back of Epcot Food and Wine Late Nights Live at the Food & Wine Festival suggests maybe they have. Whatever you do, don't call it a Fastpass. You can now get a "Return Time Ticket" at Disneyland to meet and greet Anna and Elsa from Frozen. If you want your daughter to look like them as well, pay a visit to Anna & Elsa's Boutique opening at Downtown Disney on October 6. Big Hero 6 opens in U.S. theaters on November 6, 2014, but you can get a sneak peek by heading to Disneyland starting September 26. Previews of the latest from Walt Disney Animation Studios will be showing in Tomorrowland's Magic Eye Theater. 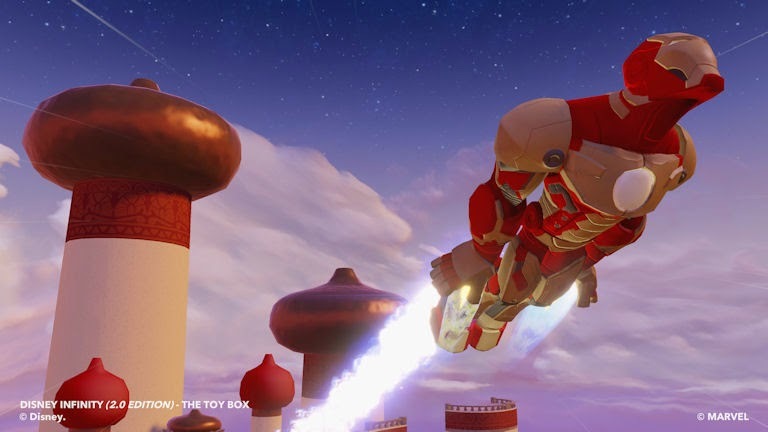 The launch of Disney Infinity 2.0 is just a week away. 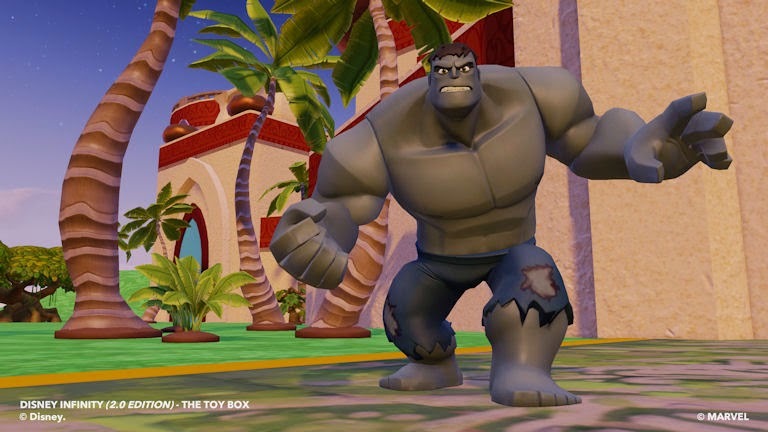 Disney Interactive announced Tuesday there would be a total of 82(!) Power Discs available to customize and enhance game play. For Walt, it always came back to trains. His father, Elias, and his Uncle Mike both worked for the railroads at one time. One of Walt's first jobs as a teen was as a news butcher selling magazines and snacks on the trains that criss-crossed Kansas City and the surrounding areas. Trains would find their way into Disney films from Casey Jr. in Dumbo to the Civil War adventure The Great Locomotive Chase. Early plans for Disneyland changed often in size and proposed locations, but the one constant was always the presence of at least one train, usually circling the park. "Grand Circle Tour" would one day embed itself in the Disney vernacular as a memorable and magical train trip. And then, of course, there was Walt's beloved Lilly Belle, the 1/8th scale model train that wound its way through his backyard in Holmby Hills in the 1950s. 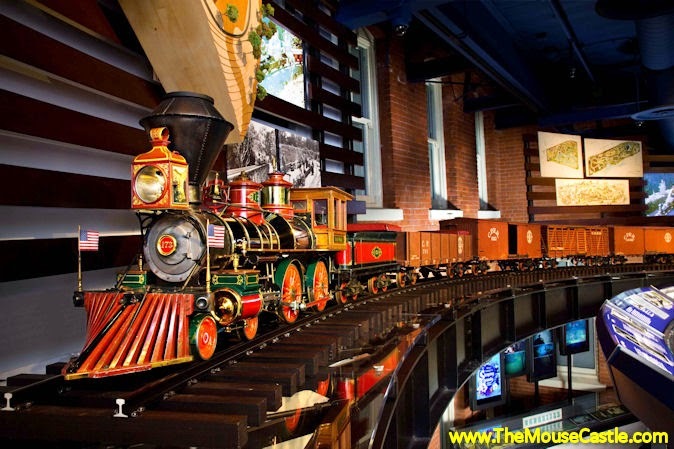 The Walt Disney Family Museum will celebrate Walt's railroading passion with the new exhibition All Aboard: A Celebration of Walt's Trains. It will run from November 13, 2014 through February 9, 2015 at the museum's Diane Disney Miller Exhibition Hall. Curated by Michael Campbell, president of the Carolwood Pacific Historical Society, the exhibition will contain more than 200 artifacts, firsthand accounts, archival videos, images of Walt with his trains and actual model trains that will run throughout the show. It will also spotlight two of Walt's "Nine Old Man" who shared his love of trains, Ward Kimball and Ollie Johnston, not to Imagineers, Roger Broggie and Bob Gurr, who were instrumental in making the trains at Disneyland a reality. For tickets and more information about the Walt Disney Family Museum, visit www.waltdisney.org. This wins the Internet today: the DuckTales theme with real ducks. And if that makes you feel a bit nostalgic for the '90s, through September 14 Disney is going retro at http://partners.disney.com/throwback to celebrate all those great Disney Afternoons. It's a week-long flashback on Disney.com and Disney Blogs to mark the back-to-school season. You can join the fun by posting your favorite '90s pics on Twitter and Instagram with the hashtag #ThrowbackToSchool. The best ones will be featured on Disney Blogs. So spin it, let's begin it and let's get dangerous. Inside The Mouse Castle 09-05-2014 - Deadmau5 vs. Disney, a 'Hullabaloo' Over 2D Animation and Happy Birthday, Pluto! Does Deadmau5's logo violate a Disney trademark? We don't think so either. Joel Zimmerman is going toe to toe with Disney over his big mouse head. The house musician, who performs under the stage name Deadmau5 (pronounced "dead mouse") usually wears a large mouse-shaped helmet when he performs and has done so for well over ten years. 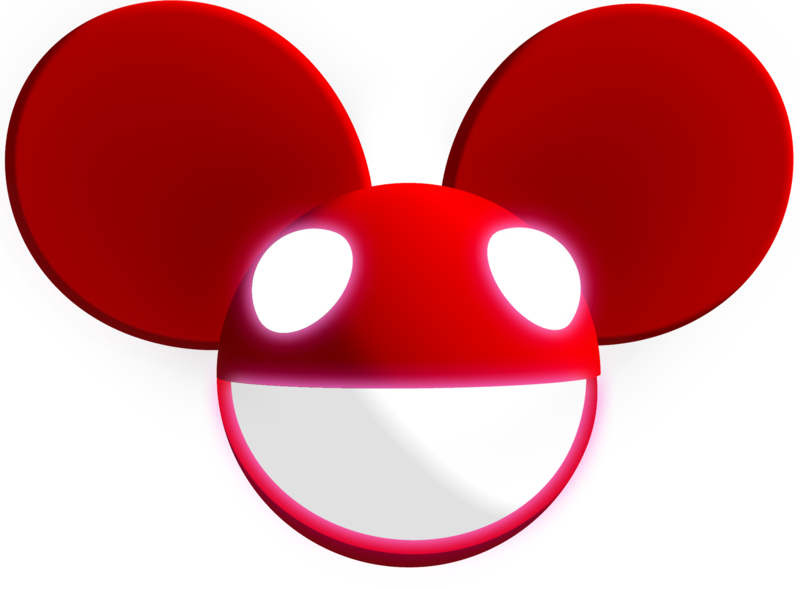 He recently registered his mau5head with the U.S. Patent and Trademark Office and Disney is not happy about it. They've filed a trademark infringement suit, claiming Deadmau5's signature look is way too similar to their own in-house mouse. In the latest Inside The Mouse Castle, Anthony and I talk about the trademark controversy and we're siding with Deadmau5 on this one. Does he resemble Mickey Mouse on stage? Yes. Could a reasonable person mistake Deadmau5 for Mickey? We don't think so. UPDATE: Since we recorded the show Friday, Deadmau5 has upped the ante, filing a cease and desist order against Disney over their alleged inappropriate use of one of his music tracks in a video. It appears Deadmau5 has as much arrogance as Disney has deep pockets for lawyers. Grab your popcorn, kids. This is going to be fun. A group of former Disney animators led by director James Lopez is crowdfunding a steampunk-style 2D animated film with a smart and savvy female protagonist. We're loving the look of Hullabaloo and we encourage you to contribute to it on Indiegogo. In Marvel news, Al Pacino is gushing over Guardians of the Galaxy and director James Gunn has taken notice. Could the great actor be in line for a role in GotG 2? Also, hear about the Stan Lee cameo in Guardians that didn't happen and how Lee may have spilled the beans on a Black Panther movie. Destination D: Attraction Rewind is a two-day D23 event at Walt Disney World November 22 and 23. We're really excited about two recently announced presentations: one by Imagineering Legend Tony Baxter and a panel discussing Brad Bird's upcoming film Tomorrowland. There's a Happiest Haunts guided tour that's going on at Disneyland this Halloween season. Apparently it's been around for a few years now. How did we not know about this? Also, Walt Disney World will be opening a Haunted Mansion shop sometime soon that's going to be as heavy in theming and backstory as it is in merchandise. It's a good weekend to celebrate birthdays. Mickey's pal Pluto (or the character who would become Pluto) made his debut in The Chain Gang on September 5, 1930. The Morocco pavilion in Epcot's World Showcase opened 30 years ago on September 7. And finally, on September 5, the Hoop-Dee-Doo Musical Revue marked its 40th year of dinner theater performances at Pioneer Hall at Walt Disney World's Fort Wilderness. I'm back from Anaheim with all the news from the Disneyland Half Marathon Weekend. Meanwhile, Anthony is up to his fourth viewing of "Guardians of the Galaxy," which returned to number one at the U.S. box office in its fifth week of release. 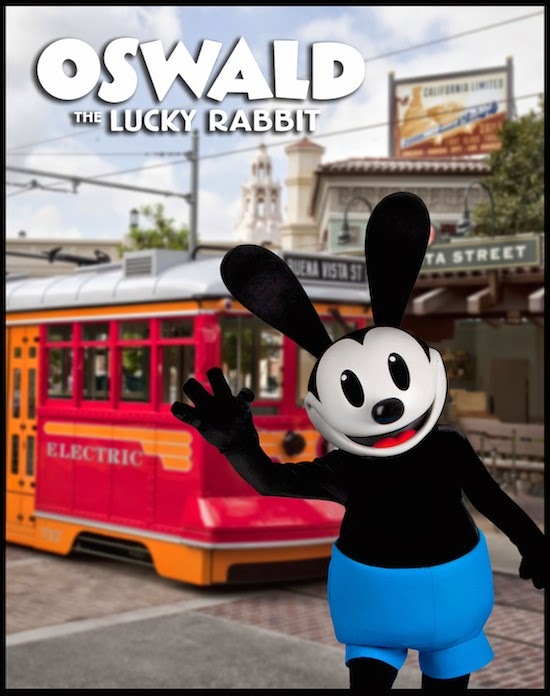 Oswald the Lucky Rabbit will begin making character appearances at Disney California Adventure on September 14. Can Duffy please go now? Oswald the Lucky Rabbit at DCA. Photo courtesy the Disney Parks Blog. On Saturday, 101 dogs decked out in Disney duds invaded the Magic Kingdom at Walt Disney World as part of the Disney Side Dog's Day. The event featured a doggy dance party, a walk down Main Street to Cinderella Castle and a costume contest. 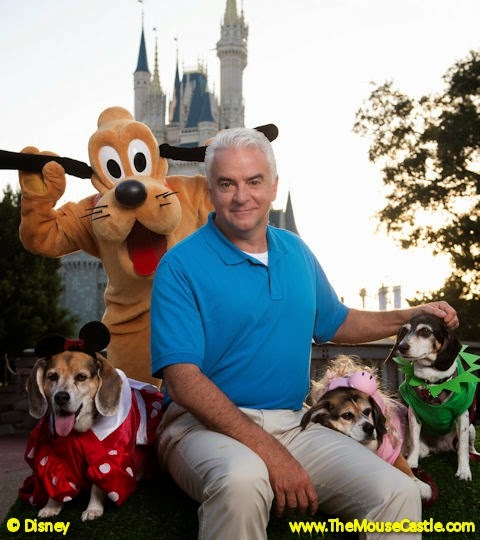 Animal Planet was on hand to shoot footage for the upcoming special America's Cutest: Disney Side Howl-O-Ween hosted by John O'Hurley. with Pluto, Animal Planet host John O'Hurley and a few friends. The Story of Frozen: Making a Disney Animated Classic airs tonight on ABC. You know, just in case you haven't heard anything about the film. Pixar released the first film clip from Lava, the animated short opening with Inside Out next June. It's the story of a lonely, love-starved, musical volcano, or as Pixar describes it, "a musical love story that takes place over millions of years." Derrick Deaton shows off his Disneyland Half Marathon medal. Many runners have personal stories about why they run. They talk of what motivated them to start running, or maybe a person or cause they run for. Few have a story as inspiring as Derrick Deaton. Five years ago, Derrick was in no condition to be running anywhere. A "sedentary lifestyle and eating whatever you want" caused him to weigh in at a whopping 529 pounds. Tired of his excessive weight, Derrick committed himself to being healthy. He began eating better and started walking, first to the end of his block, then longer distances. Walking led to running. Running eventually led to entering 5Ks. 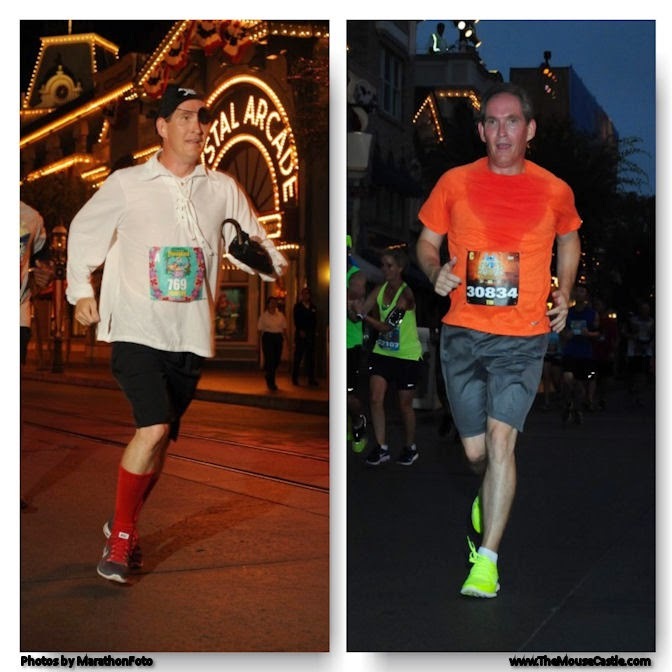 In 2010, Derrick, a die-hard Disney fan, entered his first runDisney event. This past Sunday he ran the Disneyland Half Marathon. He finished with an impressive time of 2:19:27 and did so 346 pounds lighter than he was in 2009. Derrick appreciates that he has the ability to inspire others. "My message to other people is just to start doing something," he says. "Be active in some way."